We’d love your help. Let us know what’s wrong with this preview of Spectacle by David Rockwell. 'Spectacle' is a visual essay that celebrates the phenomenon and history of public performance worldwide. Colour and archival photographs document 19 events, among them the Olympic Games, the Running of the Bulls in Pamplona, and the Burning Man festival in the Nevada Desert. To ask other readers questions about Spectacle, please sign up. 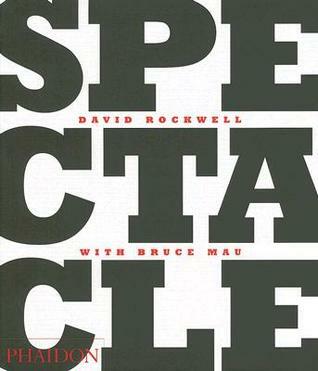 Spectacle is a survey of Baroque maximalism in modern times, covering events and places which are big, bold, or brief: Burning Man, Las Vegas, NASCAR, the Running of the Bulls, the Macy's Thanksgiving Day Parade, and more. I definitely enjoyed the book, but its depth and focus were mildly unnerving: it was not quite a travelogue, not quite a full study of these grandiose events, and not emotional or detailed enough to be really engaging. The photography, layout, and pace of the book (designed by Spectacle is a survey of Baroque maximalism in modern times, covering events and places which are big, bold, or brief: Burning Man, Las Vegas, NASCAR, the Running of the Bulls, the Macy's Thanksgiving Day Parade, and more. I definitely enjoyed the book, but its depth and focus were mildly unnerving: it was not quite a travelogue, not quite a full study of these grandiose events, and not emotional or detailed enough to be really engaging. The photography, layout, and pace of the book (designed by the great Bruce Mau) was the highlight of Spectacle, but the interviews peppered through the book were somewhat dry or forced, and the longer-form essay at the end was odd and largely incomprehensible. David Rockwell has captured far-flung and fleeting human spectacles for us to marvel at. All the spectacles in his book are planned: intentionally created and experienced by willing participants, usually for pleasure. On the other hand, spectacles that arise from tragedy are different — we call them memorials. They are created organically, driven by the creativity of collective bystanders randomly brought together by disaster. Each individual is so inexplicably moved by the emotions and meaning o David Rockwell has captured far-flung and fleeting human spectacles for us to marvel at. All the spectacles in his book are planned: intentionally created and experienced by willing participants, usually for pleasure. On the other hand, spectacles that arise from tragedy are different — we call them memorials. They are created organically, driven by the creativity of collective bystanders randomly brought together by disaster. Each individual is so inexplicably moved by the emotions and meaning of death and loss that they participate in a sort of organized chaos in order to cope. We learn that tragedy bonds people and creates meaningful order that may last many lifetimes. Disappointing. Full of boring interviews, poor quality photos, and a collection of mostly yawn-worthy spectacles, including Macy's Thanksgiving Day Parade, NASCAR, Burning Man, Olympics, Fireworks. The book does nothing to make a reader/viewer feel like they are actually a part of any of these events. Really not worth even checking out of the library. Beautiful photography and some interesting interviews and commentary. It's a good coffee table book. However, it lacks depth of understanding as to why humans enjoy spectacle. It also concentrates only on the 20th century.